Dr. Clarvil was sponsored by Endourologic Society to attend the World Congress of Urology in Vancouver, Canada. First, I must thank Dr. Lanctin, big partner of Haitian Urology for choosing and recommending me to attend this great event, Dr. Denstedt who accepted me immediately and you, Michele, for your assistance which allowed me to effectively get to Vancouver. I congratulate all the committee organizer members for their know-how. Finally, I thank all participants for their role play. I can’t forget the sponsors. The WCE 2017 meeting was a great experience for me. It allows me to update my knowledge in the field of Endo Urology particularly minimally invasive surgery. I’ve met a lot of VIP in this field from all over the world. I’ve enjoyed the presentations and all the topics. It was even amazing to participate. Also, Vancouver is a beautiful city that I discovered. This scholarship is important for residents, fellows, Urologist especially from developing countries living with low budget. Now, it is the time to persuade deciders in our country to provide appropriate equipment to practice such surgical techniques and allow patients to benefit from scientific progress. I promise, I will share these experiences with other colleagues, medical school students and residents. I hope others, either mentors or residents from my team will benefit from such a good program. My experience will be profitable for my patients and for my country. I thank Cook Medical for the work shop on PCNL and flexible ureteroscopy. Thank you, Dr. Ben Chew. Planning for this event began May 2016 in San Diego at the annual meeting of the American Urological Association. At that time I was offered the opportunity to participate in a project to bring ESWL, a non-invasive kidney stone treatment, to Haiti. Long term business associates and friends Chris Gleason (CEO, NextMed Inc,) and Todd Pierce (CEO, Translational Analytics and Statistics Inc.) were aware of our work in Haiti and had a desire to go international with their new decision engine for stone treatment. They felt that Haiti would be an interesting challenge for their first site. They approached Brock Faulkner (CEO Dornier MedTech, America) and they agreed to donate a refurbished ESWL unit. New units are valued at approximately $400,000. After my initial disbelief transitioned into doubts that it could be successfully accomplished, I discussed it with Dr. Pierre-Alix Nazon, a urologist from Haiti who was also attending the AUA in San Diego. At that time Dr.Nazon was the leading kidney stone urologist in Haiti. Todd and Chris met with him to explain the details of their offer and his enthusiasm and excitement following this meeting convinced me that we needed to make it happen. This launched the year-long project. Unfortunately, Dr. Nazon passed away prematurely in January 2017 before seeing it's completion. 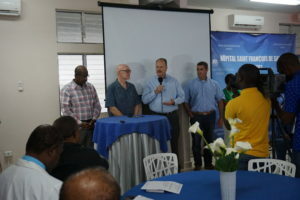 The timing of the offer coincided with negotiations between our newly formed Global Association for the Support of Haitian Urology (GASHU) and the governing board of Hopital St. Francois de Sales (HSFDS) for a “Memorandum of Understanding” to develop a urology center of excellence in Port-au-Prince. Our goal was to establish a center which would function as a facility to teach Haitian urology residents and provide contemporary urological care to all patients in Haiti. A number of generous donations have facilitated this: the Global Philanthropic Committee (GPC) of the AUA and the Societie Internationale Urologie provided funding for a full time urology nurse, ForTec Medical Inc. donated a Holmium laser lithotripter, Karl Storz Urology inc. donated a complete set of new adult and pediatric urological endoscopy instruments, and Dr. John Denstedt, the Endourological Society and Cook Medical,Inc. lent expertise and funding to start a percutaneous nephrolithotomy (PCNL) program in Haiti (see report from March 2017 trip to HSFDS). ESWL would be the final piece in the formation of a stone treatment center. Although the unfortunate loss of Dr. Nazon was untimely, other urologists from the Haitian Society of Urology stepped up to complete the project. This effort was led by Dr. Bernard Brutus, Dr. Youry Dreux and Dr. Reginald Valme. Resident participation by Dr. Christian Valme, in particular, was invaluable. The Haiti ESWL project included crating and shipment of the equipment (totaling 2532 lbs.) to Coconut Creek , FL after complete refurbishment. This was organized and funded by Dornier who have proven to be dedicated partners. 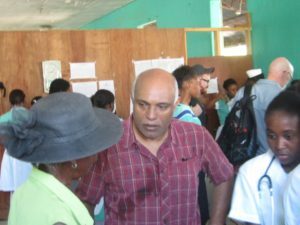 With the help of HSFDS and Dr. Bernard Brutus, arrangements were made to have the equipment shipped by sea from Florida to Haiti by Food For The Poor Inc. This process, which included clearing customs was accomplished smoothly. Dr. Dreux and the GPC funded nurse, Japhare Joseph, were chosen to be the ESWL technicians and their training was meticulously planned, funded and undertaken by NextMed. They both completed an internet based training course before attending an intense specially designed simulation and live training course over a 2 week period in Tucson, AZ and Dallas, TX. Dr. Brutus and Dr. Reginald Valme also spent time observing at a NextMed ESWL center in Fort Lauderdale, Fl. 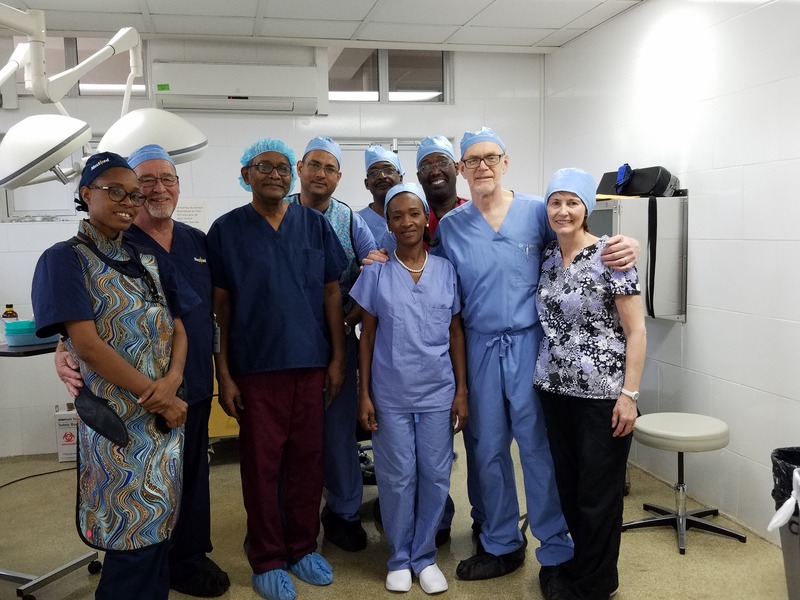 Following the 2017 annual meeting of the AUA in Boston Todd Pierce, Chris Gleason, Brock Faulkner, Mary Butler (Chief Technology Officer, Dornier MedTech International), my wife Pat and I flew to Port-au-Prince for the inauguration of the ESWL unit and treatment of the first cases. Our arrival was preceded for several days by the arrival of Dornier engineer Patrick Dixon, whose task it was to install the unit and deal with the complexities of an unpredictable power supply. Being experienced with installations in multiple countries, as well as a great team member, he proved to be the perfect person for the task. The day prior to our arrival, the lead trainer for NextMed, Paul Starr arrived to inspect the equipment to ensure a successful launch. He worked with Patrick, and the Haitian ESWL “techs” Dr. Dreux and Japhare to familiarize them the the nuances of the Compact Delta I. He also coached them on the complex computer based data reporting program that they had learned about in Tucson. Completion of this data entry to record patient outcomes data is the only expectation that was requested in return for the generous donation. By the time we arrived all was set from the equipment perspective and the Haitian urologists had lined up a number of stone patients who eagerly awaited non-invasive treatment of their kidney stones. On Thursday May, 18th, 1 year after the initial offer, a reception was held at HSFDS in conjunction with a press conference with the national Haitian media to celebrate the launch of the ESWL program at the stone treatment center. The enthusiasm and pride of the hospital staff and administration was palpable and we know from the number of patients who presented at the hospital the next day looking for treatment of their kidney stones that the word was disseminated by the news media. After the ceremony, we successfully screened a large number of patients, reviewing each case with the local urologists and teaching appropriate work up, evaluation and patient selection. This process will be greatly aided by the Translation Analytics and Statistics decision engine. Over the next 2 ½ days we did 15 successful ESWL treatments (14 patients with kidney stones and 1 with a distal ureteral calculus). Dr. Dreux and Japhare proved to be very capable and knowledgeable from their training and Paul was a seasoned, laid back teacher who allowed them to work through the complexities of operating the system. Patrick stayed back an extra day to support and work on power issues. Several items that need to be adapted were identified and will be addressed, demonstrating Dornier’s long term commitment to the program's success. The hospital electrician and Bio-Med technician were trained and familiarized with the system and with the help of “Zoom conferences” technical support will be accomplished remotely as much as possible. Dr. Dreux and Japhare will participate in the data retrieval program and regular internet based bi-monthly conferences with US NextMed technicians for ongoing training and feedback on their outcomes. Upon departure the consensus was that the stone center had a viable ESWL program to offer Haitian patients and the core urologists and technical support staff were well positioned to provide outcomes that would rival top US treatment centers. The dedication of Todd, Chris, Brock and Mary along with the staff of their companies, NextMed and Dornier was inspirational. HSFDS is proving to be a very willing and enthusiastic partner in this project to form a urology center of excellence. From the opening reception we felt welcomed. We were served lunches daily which included very appetizing Haitian dishes and on the last day we were presented with gifts. The nursing staff in the OR, and on the wards were enthusiastic and willing to learn. On Saturday morning we were pleased to have Mgr. Serge Chadic, a hospital board member, come to observe one of our cases. The only dark cloud that hung over this very satisfying 3 day experience was that Dr. Pierre-Alix Nazon was not present to bear witness to the outcome of his visionary thinking. We anticipate that many Haitians will benefit from the generosity of this donation from NextMed, Dornier, Translational Analytics and Statistics, and all those who helped to make this ambitious project a success. SAGES has once again teamed up with the Arnold P. Gold Foundation, honoring practicing physicians who best demonstrate the ideals of compassionate and respectful care for a patient’s physical and emotional well-being. This award is designated for a clinician who is recognized by the surgical/GI community for excellence in patient care and surgical practice and is granted for significant surgical-endoscopic skills, patient care, contributions to community and volunteerism. Dr. Severson is the Co-Founder and Co-Director of the Minnesota Institute for Minimally Invasive Surgery, Director of the Minnesota Reflux and Heartburn Center and Program Director for Advanced GI MIS/Bariatric and Flexible Endoscopy Fellowship. Dr. Severson is member of SAGES Global Affairs committee, facilitating the Global Surgical Curriculum, which provides SCORE-based tele-education on a regular basis to the residents, faculty and private practice surgeons of Haiti. Dr. Severson has spent over 30 years educating surgeons and medical professionals on every level imaginable in the U.S. and abroad. Even more impressive than that is that Dr. Severson is the Founder and CEO of Project Haiti. Through this effort, he has personally made over 70 trips to the poorest country in the world, with the sole purpose of teaching laparoscopic and endoscopic surgery. He played a huge role in building a state-of the-art hospital with full minimally invasive surgery capabilities in a town that rarely has running water or power. Not only did he build it, but he taught the people there how to use it. Over the years, he has successfully put on laparoscopic workshops that have allowed people in the poorest country in the world to enjoy the benefits of minimally invasive surgery. The most incredible thing about Dr. Severson though is that he has made all of these incredible contributions to the education of others very quietly, without seeking reward or recognition. He does it because he loves it. He lives for it. His teaching knows no boundaries, and includes medical students, residents, fellows, attendings, in a classroom setting, in the OR, on the podium, in a meeting, on a teleconference, and in the poorest country in the entire world in a building with no power. His dedication is truly inspiring. Dr Pierre-Alix Nazon, beloved husband and father, died on Tuesday, January 17, 2017, at the age of 56. Born on August 11, 1960, Dr. Nazon had an illustrious career in private and academic urology in Haiti, devoting his life to providing the best urologic care that Haiti can offer. While he was an extremely progressive and talented urologist, his greatest love was for his family, his children, his friends, his colleagues and the Haitian people. He has left a deep void in the heart of his beloved wife Regine, his sons Jean Paul and Samuel, his daughters Kara and Lara – both young physicians, his mother Maud, his brother Claude and his two sisters Marie-Helene and Marie Maude. He was an avid soccer player and was known for his athleticism. Despite being a calm and mild mannered person, always with a gentle smile on his face, he was a karate teacher. He instructed soccer and karate to his peers, friends, and colleagues. He attended medical school in Haiti at the Universite D’Etat D’Haiti, and went on to complete his residency training in urology at the same institution. Son of a renowned urologist and pioneer in Haitian Urology, Dr Claude Nazon, he followed the footsteps of his father and sought further training abroad. Pierre-Alix was accepted for a fellowship in lower urinary tract endoscopy at the Urology Department of the University Hospital in Lyon, France under the direction of Professor Paul Perrin in 1989-90. To further his training he spent 3 months in Israel mastering upper urinary tract endoscopy and lithotripsy (1995). When he returned to Haiti, he was actively involved in residency training and the development of a stone management program in Haiti. He attracted a busy clinical practice in Port-au-Prince and surgically treated numerous patients with minimal resources. He had great vision for the future of Haitian Urology. From the onset, he was most receptive to collaborative efforts between international and Haitian urologists. This past May 2016, he traveled to San Diego (USA) to attend the America Urologic Association (AUA) meeting to represent Haiti at the Global Philanthropic Committee meeting. Along with some international urologists he conceived of the required strategies to improve Urologic care in Haiti. 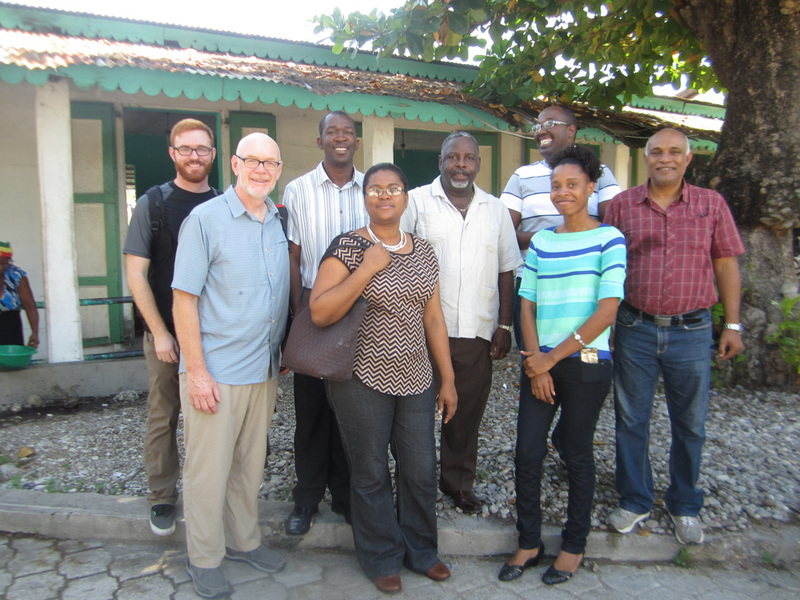 He has been welcoming to changes and educational opportunities in order to improve urologic care in Haiti. He has authored numerous articles in Haitian medical journals and has given several conferences. He has pioneered minimally invasive kidney stone management in Haiti. He was one of the first urologists to introduce transurethral resection of the prostate (TURP), ureteroscopy and extracorporeal shock wave lithotripsy in Haiti. He was a leader in the Societe Haitienne D’Urologie (SHU) and the newly created Global Association for the Support of Haitian Urology (GASHU), which he helped name. He was instrumental in drafting the memorandum of understanding that currently governs the SHU and the University Hospital Saint Francois de Salles. Dr. Nazon was an extraordinary teacher and mentor, having trained countless interns, students and residents in clinical Urology. He was profoundly devoted to helping develop the state of the art management of stone disease in Haiti. Pierre Alix’s death leaves a great void for his family, his colleagues, and within Haitian Urology. His family will remember his limitless love and the sacrifices he made to provide them with the highest quality of life and the best education possible. His friends will remember him as an avid accordion player and a devoted soccer player. His soccer teammates will remember him for his love of the soccer field where he exhaled his last breaths at the tender age of 56. A Memorial Service for Dr Pierre Alix Nazon was held on January 21, 2017 at Parc du Souvenir, Tabarre, Haiti. Countless family members, colleagues, and friends were gathered to pay their last respect. You will be missed Pierre-Alix. Rest in Peace. "On behalf of the Haitian people, thank you for the generosity,leadership, and all the good work your team does. I agree with Henri , this is a remarkable project with huge impact on surgical care in Haiti. Ben thank you so much for helping with Haiti Customs." "Thank you Angelo... But it is nothing compared to what you are all doing to improve Haiti's health care in you respective fields. It is a privilege for me to have brought this tiny grain of sand in this lap project. Again thank you very much to you all from GASHU and Project Haiti for your engagement in making us enter a modern era in Urology and surgical practice in Haiti. I traveled to Port-au-Prince, Haiti from March 4 – 11, 2017 as part of a small group of urologists doing humanitarian surgery associated with Project Haiti and teaching in the city of Port-au-Prince. We worked at the Hopital Saint-Francois de Sales in the center of the city. The hospital was rebuilt following the earthquake in 2010 and just reopened 2 years ago. 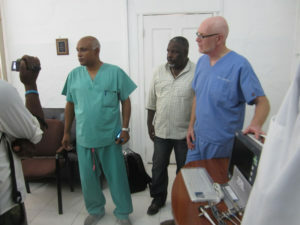 We did have a video teleconference with the local urologists approximately 2 weeks before the trip to Haiti. That provided me the opportunity to project a handful of instructional slides, walking through the various aspects of a PCNL case including positioning, gaining access and conducting the stone removal. Cook Canada supplied me with approximately $12,000 of new disposable equipment such as guidewires, balloon dilators, stone baskets and so forth which I packed up in large suitcases and took with me to Haiti. This equipment lasted to about mid week and then after soaking in Cidex I began to re-use this equipment on the subsequent cases. There were many interesting challenges to conducting the cases. When I assessed the support services at the hospital the day we arrived, I found out there was no blood bank, no angiography and embolization in the entire country and the hospital had no step-up or ICU type of facilities to stabilize the septic or otherwise unstable patient. The preoperative assessment of the patients was limited to KUB x-rays for the most part and CT assessment was not available due to costs. The hospital did have a reasonably new C-arm but no one available or familiar with operating it. Project Haiti had purchased a used ultrasound lithotripsy unit which we had planned to use unfortunately this arrived with all components except the probes and therefore was not useable. We made due with a pneumatic device that , with some improvisation, was able to fragment renal stones. During the week there were occasional power outages that took down the entire operating room including the Anesthesia monitoring equipment and ventilator plus the C-arm and light sources. We would just wait things out and then proceed again when the power came back on. The nursing staff were excellent and enthusiastic and quickly picked up on the nuances and flow of endourologic cases. All of the cases were performed successfully without complication and all patients went home within a day or two which represents a significant advance to the typical care path. The team arrived by air on Mar.4 and checked in to Le Plaza Hotel, near Hopital St. Francois de Sales (HSFDS) in downtown Port-au-Prince. A team dinner/meeting with Haitian urology colleagues was held that evening. The next day we visited HSFDS, toured the facility and OR’s. Time was spent organizing equipment, meeting staff and seeing pre-op patients. Drs. Burks and Rosenstein, working with Dr. Santucci’s fellow Dr. Maxx Gallegos performed, taught and proctored a total of 7 urethral reconstruction procedures. 2 were repeat procedures. There were 4 excision and primary anastomosis cases, 1 buccal mucosal graft, and 2 pelvic fracture urethral injuries. Two of the patients were pediatric (7 and 11 years). Application procedure for Peyronies disease was also completed. There were no complications encountered at the time of team departure from Haiti. Average estimated blood loss was 160 cc. With these cases, this team has now taught and performed 69 urethral stricture cases in Haiti. Haitian urologists, particularly Dr. Youry Dreux, continue to improve in their ability to do cases independently. Accordingly, workshops tend to have a higher number of either repeat procedures or a greater level of difficulty. Concurrent with the reconstruction workshop, in a second room, a total of 16 stone procedures were performed on 11 patients. 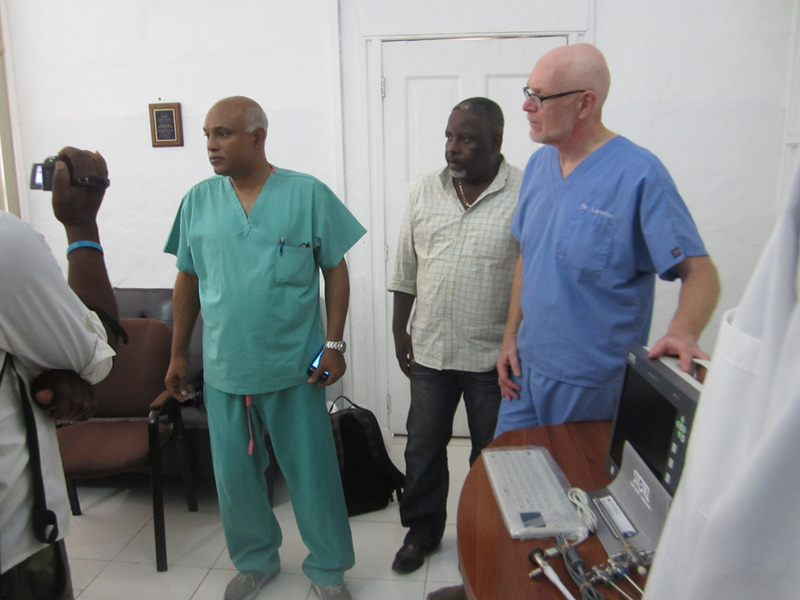 This was led by Dr. John Denstedt, who on this trip performed the first percutaneous nephrolithotomy (PCNL) in Haiti. The team also included endourologists Dr. Bob Marcovich and Dr. Keegan Maxwell as well as general urologist, Dr. Henri Lanctin. A total of 13 PCNL’s, 3 semi-rigid ureteroscopic procedures and a percutaneous removal of bladder calculus were performed. Despite significant pre-planning, technical difficulties were encountered, including the absence of ultrasonic lithotripsy probes, mechanical problems with the backup pneumatic lithotripsy device and an underpowered laser unit which frequently overheated and required cooling and rebooting. These technical issues were compounded by lack of adequate pre-op imaging (CT scans or IVP) and a high level of complexity (large, multiple, dense stones with complex anatomy). There was only 1 case that a solitary stone could be removed without fragmentation. Because of the above factors, 5 “second look” procedures were performed: 1 large staghorn due to mechanical problems with the pneumatic lithotripter, 2 due to complex intrarenal anatomy (1 with scarring from previous surgery, 1 with blown out calyx and scarred infundibulum), and 2 large, dense midureteral calculi which were embedded in the urothelium. Despite the above issues and complexities, no complications were encountered by the time of team departure and all cases were either completely stone free by fluoroscopy or the offending calculus was removed. In all cases there was a Haitian urologist scrubbed and assisting. Both the reconstructive and stone workshops were facilitated by pre-workshop teleconferences with team physicians and Haitian colleagues which included didactic lectures, Q&A sessions and presentation of proposed surgical patients by the Haitian team. This proved to be extremely effective and improved pre-workshop planning and scheduling of cases. A great deal of time was spent planning next steps for the successful development of the stone treatment center at HSFDS and it is the hope that a young urologist or senior resident will be able to successfully apply for an Endourological Society fellowship for hands on training at a high volume center, such as currently exists in India. Dr. Christian Valme (4th year resident) was invited by Dr. Denstedt to apply to the financial committee of the ES. The technical and equipment issues were discussed and plans devised to hopefully deal with them. It is anticipated that a second PCNL / URS workshop may be held as soon as late fall 2017, perhaps to coincide with GASHU annual meeting. 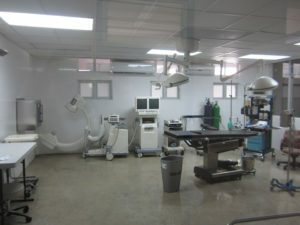 Funding for the PCNL / ureteroscopic workshop as well as procurement of equipment and supplies for the stone center was provided by the Endourological Society, a grant from Cook (Canada), Storz Urology, Project Haiti and Project Haiti team members, their hospitals, and various other equipment representatives. Mr. Chris Gleason from NextMed, LLC who has partnered with Dornier to donate a Dornier ESWL unit joined us to tour HSFDS, meet with team members and hospital administration and develop a time line for implementation of the project. He also outlined the stone treatment decision engine that has been developed and our requirement to participate in outcome tracking and analysis. It was decided and arrangements were made to ship the unit now. Discussions occurred regarding who to send for training in Tucson, AZ with the GPC funded nurse and this was deferred to Haitian urology leadership for final decision. The 2 urologists who will be trained on the ESWL unit will be Drs. Bernard Brutus and Reginald Valme and they will be trained at a NextMed site in West Palm Beach. The dates for the first cases have tentatively been set for May19-21, 2017. Preliminary discussions were held with an international radiology group, Rad-Aid regarding CT scanning and support at HSFDS as well as radiology resident and technician training. Contacts and introductions were made with further follow up planned. It is the hope of the team that over time, when word spreads that minimally invasive treatment options are being competently performed at HSFDS, Haitian patients with symptomatic stone disease will present earlier. This will mean smaller, less dense stones which can be more easily treated and, more importantly, lead to less suffering. With our efforts Haitians from all socioeconomic backgrounds will have equal access to these treatment options. The Societe Haitienne D’Urologie (SHU) and the Global Association for the Support of Haitian Urology (GASHU) are proud to announce the official signature of a Memorandum of Understanding between the SHU and St. Francois de Salles on Friday, August 26, 2016 in Port-au-Prince on the premises of the newly built Hospital. For more than 20 years, foreign urologists have independently provided direct patient care in Haiti or conducted educational seminars to share their expertise with fellow Haitian colleagues. In general, these activities have operated independently without cross-coordination and thus have failed to achieve their full potential. To overcome these shortcomings, several Haitian, American, and International Urologists have dedicated great efforts and resources for the past 5 years towards numerous seminars, workshops, AUA supported Ultrasound Workshops and two-day conferences in Port-au-Prince (2013, 2014). This has helped the organization overall to evolve into a better organized and coordinated Urology Association. The newly named Global Association for the Support of Haitian Urology (GASHU) will be able to streamline these efforts in order to maximize the positive impact to urology training, practice and patient care in Haiti. GASHU has recently identified the newly built Hospital St Francois de Salles (Port-au-Prince, Haiti) as one of the premiere hospitals in Haiti which offers great potential for the training of Residents and the development of surgical workshops. The geographic location and infrastructure of Hospital St Francois de Salles (SFDS) are superb. The Haitian Clergy and Leadership at SFDS are very welcoming and eager to help the Haitian Community at large. This significant effort which holds great promise to change the landscape of urologic care in Haiti is supported by several influential foreign global Urology organizations and international leaders in the field of Urology. The members of these efforts include the American Urologic Association ( AUA ) the Global Philanthropic Committee ( GPC ) , Societe Internationale D’Urologie - SIU, International Volunteers in Urology (current name Ivied ) Association des Medecins Haitiens a l’Etranger (AMHE) , Societe Haitienne D'Urologie (SHU) , Genito-Urinary Reconstructive Surgeons- GURS, Project Haiti, Notre Dame Filariasis Project, and Konbit Sante to name a few. The Mission of the Organization is to improve academic urologic training in Haiti by working with the residents and to better coordinate the efforts of non-Haitian urologists contributing to urologic care in Haiti. 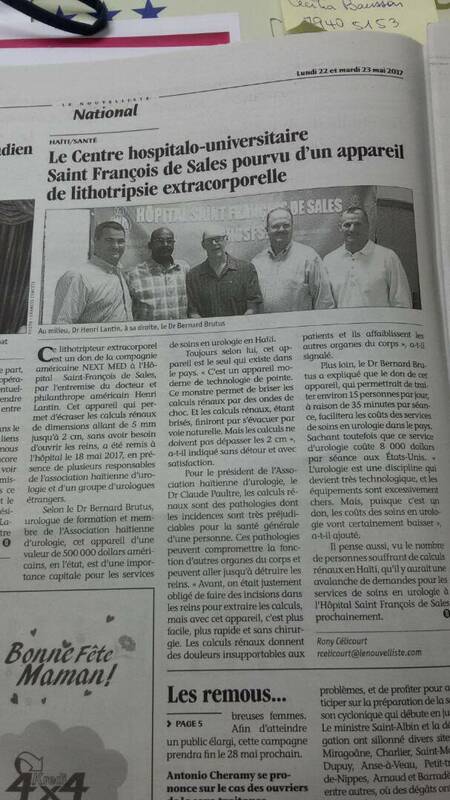 This will also improve access and quality of urological care in Haiti. Another focus point of our mission is to increase educational awareness towards the Haitian public on the importance of urologic disorders. This mission will be completed through various media outlets and activities. 1- Endoscopic Equipments worth more than $ 350,000.00 donated by Karl Storz through GPC and delivered to St Francois de Salles, Catholic Charity Hospital (Port-au-Prince) on August 26, 2016, and previously to Les Cayes (State Hospital) July, 2016, and State Hospital Justinien (Cap Haitian), August 22, 2016. These instruments will allow for adult and pediatric endoscopic treatment of prostate and bladder diseases. 2- Three ultrasound and endoscopic units donated to the HUEH ( Hospital de L’Universite D’Haiti ) by Drs Lanctin ( Project Haiti ) , Gousse ( AUA liaison to Haiti ) , De Vries ( President of IVUMed ) and Badlani ( former Secretary General of the AUA ) . The ultrasound equipment will allow for prostate examination and biopsy, as well as imaging of the upper (kidneys) and lower (bladder) urinary tract. Prostate cancer is very prevalent in Haiti and these technologically-advanced units will significantly help with earlier detection of prostate disease. 3- A dedicated Urology Nurse who will oversee the care of the instruments and help with medical staff training and coordination of the Workshops. These machines are state of the art for the management of kidney, ureteral, and bladder stones. Future GASHU Conference at Karibe Hotel (October 29-30, 2016) where many International and Haitian Urologists and residents will be presenting their clinical and academic experience in Urology during the two day conference. Following the Global Association of the Support of Haitian Urology (GASHU) meeting at the Hotel Karibe in Petion-Ville, a workshop was conducted at Hopital St. Francois de Sales. A recent agreement was signed between the Haitian Society of Urology and the hospital administration to establish a Urology Center of Excellence. This agreement includes provisions for the safety and maintenance of donated equipment and supplies, the ability of the GPC funded urology nurse and residents from the state university urology residency program to function in the hospital, and access to the hospital by the public patients HUEH and throughout the country. The objectives for this session were a VVF workshop in one OR room and a ureteroscopic workshop in the other. The latter would include lectures on laser safety with “laser certification” of the Japhare Joseph (GPC funded nurse) as the laser tech and 2 urologists as the initial laser endoscopic urologists. The number of cases was hampered by a number of factors: the hospital is new and unprepared for large number of cases, including nursing and anesthesia personnel (which we were relying on for this session), the recent resolution of the strike at HUEH which essentially shut down the residency program for over 6 months, Hurricane Matthew which was another devastating blow to the country, and the fact that Nov. 1st and 2nd are religious holidays in Haiti. Despite this, 3 VVF cases were performed, 1 case which was a repeat from a large obstetric fistula which was primarily operated on by the Haitian physicians. Two of the 3 were challenging cases however, no significant early post op complications were encountered. On the endourological side, we did 3 large distal ureteral calculi, ranging in size from 12 to 20mm. One stone unfortunately migrated to the renal pelvis and accordingly a stent was placed for later intervention. The laser functioned well and the urologists demonstrated good skills and knowledge of the laser function and settings. On the last day we performed a dismembered pyeloplasty and resection of a large bladder tumor with the Haitian urologists. Pyeloplasties for UPJ obstruction are uncommonly performed in Haiti. 1. 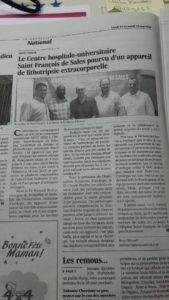 HSFDS promises to be an ideal site for the establishment of a urological center of excellence in Haiti. A lot of the obstacles that were encountered on this trip were identified by the Haitian urologists who resolved to have further discussions with administration. The OR nursing staff are engaged and want to learn. They will need education and encouragement with issues like the establishment of case cards, post op urology care, care of the equipment, etc. 2. Japhare Joseph is perfect for her role, however, needs more training re. instrument care, laser safety and as we don’t have a dedicated x-ray tech, radiation safety. 3. Including a US Urology OR nurse and anesthesia provider to future teams would be advantageous, however, not a requirement. My son, Chris, and I arrived in Port-au-Prince on Sunday, Jul. 10 after overnighting in Miami where we received the instruments to be delivered to Les Cayes from Drs. Gousse and Brutus. Monday morning I did my first case at Hopital St.Francois de Sales, with Dr. Youry Dreux, on a patient with prostate cancer. The OR and nursing staff exceeded my expectations and I believe that next week, once the agreement between HSFS and Societie Haitian Urologie (SHU) has been signed, the Karl Storz donated instruments for Port-au-Prince can be delivered. The urology service should become very busy, especially with the ongoing General Hospital strike. The GPC funded nurse, Japhare Joseph, was well received at the hospital and will work cohesively with their nursing staff. There is ample space for storage of the urology equipment, and the OR is well organized and spotless. On Tuesday morning we flew to Les Cayes with Missionary Aviation Fellowship as it was felt to be unwise to do the long drive due to current political unrest in the country. The team included Dr. Pierre-Alix Nazon , Dr. Youry Dreux, and Japhare. Upon arrival we connected with the local urologists, Dr. Sahmonde Myril and Dr. Gaby Nelson. We were taken to Hopital Immaculee Conception des Cayes, a large general hospital that serves the lower peninsula of the country. The hospital had in excess of 60,000 patient-visits last year. The situation was unchanged from my visit 2 ½ years ago with non-existent cystoscopic equipment. Patients who required cystoscopy were forced to travel the 3 1/3 hour road trip to Port-au-Prince. Dr. Myril, who attended the SIU training center in Trinidad on a SIU scholarship, and Dr. Nelson who has participated in multiple of our Project Haiti-IVUmed workshops in Pignon, were anxious to receive our precious cargo and to get to work! We were taken to meet with Medical Director, Dr. Joseph Yves Domercant in his office where the official presentation was made. There were reporters from the local and a Port-au-Prince television station present to record the event and conduct interviews. Although, I did not personally see it, I was told that the event was aired on at least the Les Cayes station. Dr. Nazon, Dr. Domercant, Dr. Lanctin, and presentation of donated equipment. We then proceeded to a conference room where we inspected and familiarized the receiving urologists with the equipment along with proper handling and set up. The monitor-camera box- light source unit was particularly studied and highly appreciated. It was communicated to the local urologists that it only be utilized with a proper surge protector unit due to the highly unstable power from the hospital generators. I conducted a teaching session on BPH, basic cystoscopy, indications and proper selection of patients for TURP along with technique, complications (especially TUR syndrome) and post op care. 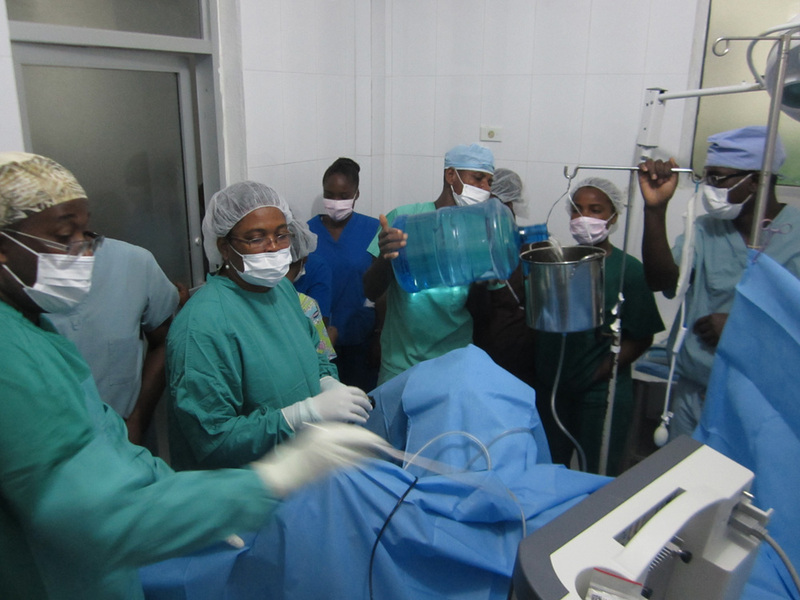 During this time, Japhare was working with the OR head nurse, teaching proper instrument care and cleaning protocol. We then had time for 1 case, a TURP, which was performed by Dr. Nelson with the assistance of Dr. Nazon. The equipment performed well and the OR staff were attentive and competent. Wednesday, with an early start we were able to accomplish 3 TURPs, a bladder neck contracture (post-open prostatectomy) and a cystoscopy. All cases were performed by the local urologists with alternating assistance from the 3 visiting urologists. The cystoscopy patient was found to have a prostate which we felt to be too large for TUR and will undergo an open prostatectomy in the near future. One other patient had uncontrolled hypertension and after a reasonable waiting period with no improvement, we elected to not proceed with intervention until he was better controlled. All patients had been in urinary retention with catheter drainage, suprapubic or urethral. The procedures were all performed in the obstetric OR as the main OR’s were undergoing renovation. Although there is no proposed completion date, we were assured by the medical director that there will be a designated urology OR. For a Haitian general hospital, we were impressed by the high level of dedication of the nursing staff. They worked well with Japhare who is proving to be an effective teacher and a wise choice by HSU. Wednesday evening we were treated to a delicious Haitian meal at Dr. Myril’s house where we were entertained with some wonderful Haitian folk music by her and her husband, Dr.George who is an internist and an accomplished guitar player. We left on Thursday morning feeling comfortable that the urologists have a good grasp of proper equipment use and clear understanding of personal responsibility for the care of it. They are not yet competent to perform TURPs, however, Dr. Nazon has committed to working out a support schedule with HSU to have urologists visit Les Cayes and work with them. In the meantime they can work on their cystoscopy skills. Both are considered to be responsible and knowledgeable of their limitations. They were asked to track all cases and report to the joint urology conference in Petion-Ville in October, which they enthusiastically agreed to do. 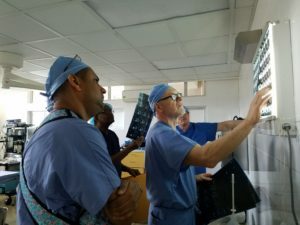 It is my belief that this donation by Karl Storz, supported by the Global Philanthropic Committee, will provide a huge service to the patients of the lower peninsula of Haiti for many years. It will also help bridge the working relationship between the urologists in Port-au-Prince and the 2 local urologists who are somewhat isolated and early in their careers. I felt a huge sense of personal gratification mixed with a deep sense of responsibility during the mission to deliver this very generous donation from Karl Storz to Les Cayes, Haiti.